Squirrel-like Time Shifter that can trap anyone in their self-portraits. She was found in the time of Leonardo da Vinci. Plumella-Con can not only use the Petra-Bash, she can also trap her opponents in goo. 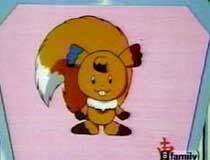 Her Japanese name is a play on Mona Lisa and "risu", the Japanese word for "squirrel".